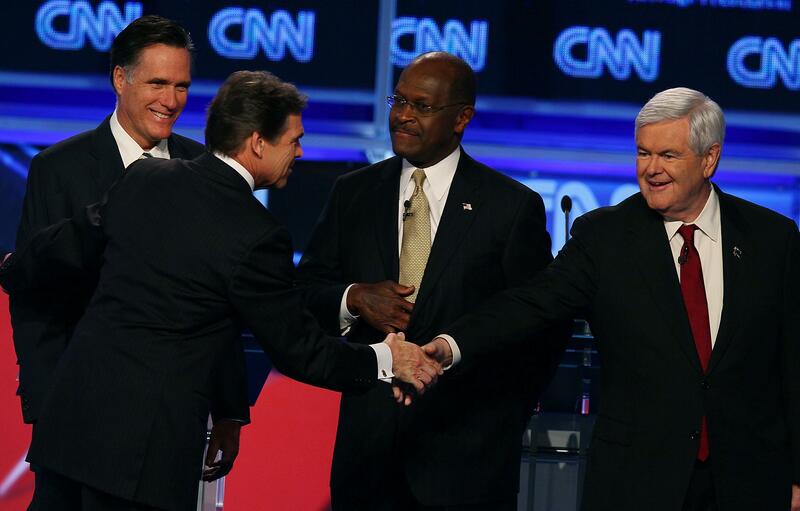 Last night, for the very first time, Mitt Romney’s campaign focused its attack spin on Newt Gingrich. The shift was really hard to miss. Gingrich’s spokesman R.C. Hammond was, for once, surrounded by reporters asking him to clear up the candidate’s immigration stance. Team Romney kept giving reporters ammo. So that’s the attack on Gingrich. The Romney solution? Much less clear. I was one of the witnesses to the Washington Examiner’s Phil Klein grinding down Romney spox Eric Fehrnstrom on how far he’d take the “amnesty” attack on Gingrich. There were a few reporters around, and none of us wanted to interrupt the flow of this. Fehrnstrom kept continuing to drive the “no amnesty” point home, and I tried to get more details. I followed up again, asking what “no amnesty” would mean for the people already here. “He would not grant them amnesty,” Fehrnstrom said. “But what would he do with them?” I asked. “I just told you, he’s not going to grant them amnesty,” he said. “He would not grant them amnesty,” he repeated. There’s no plan for that. Is there a plan from Gingrich? R.C. Hammond got that question, too (largely, again, from Klein), and it sounded like a new policy was born on the spot. The problem of high-achieving illegal immigrants can be solved locally. “Citizens can decide whether or not their neighbors who came here illegally should be able to find a path to legality.” How would these people then attain citizenship status, something the federal government grants? It was totally unanswered. Immigration solutions aren’t actually going to get hashed out over a few weeks in a Republican primary. This is where nuance goes to do. Remember the issue that weakened Hillary Clinton in 2007? It was a dodgy answer on whether New York should grant drivers’ licenses to illegal immigrants, a totally forgotten issue, but one that’s hard to find a middle ground on. The Newt/Mitt immigration discussion is just absurd – there’s a policy at issue that would affect a very small number of people, and neither candidate is actually explaining what he’ll do to fix it.